Not so long ago, only the rich and those with time on their hands could cruise in the Baltic. Today, more cruise lines – big and small – offer itineraries with insight into the history, culture, and traditions of exotic Baltic destinations. Since many ports of call have histories dating to medieval times, it’s no surprise that shore excursions include visits to magnificent edifices like the grand palaces and the fairy tale castles of Denmark’s North Zealand. UNESCO-listed Kronborg Castle in Elsinore, with roots dating to 1420, is one of Northern Europe’s most important Renaissance strongholds. Immortalized by William Shakespeare, it’s also known as Hamlet’s Castle, and the Bard’s famous tragedy is staged in the courtyard annually. In Copenhagen (the embarkation point for many Baltic cruises) Frederiksborg Castle built by King Christian IV in the early 1600s is a fine example of Renaissance architecture and today houses the Museum of National History with its collection of priceless Danish art and artifacts. A Baltic highlight is the magnificent State Hermitage Museum in Russia’s St. Petersburg. It began as a private museum for Catherine the Great in 1764 and its massive collection (more than three million objects) is housed in 353 rooms. Among the paintings are works by Raphael, Titian, Giorgione, and Michelangelo. It’s the most popular shore excursion among Baltic cruisers and passengers on Holland America and Cunard enjoy exclusive after-hours entry. Cunard cruisers are also treated to a classical concert. Limited to late spring and summer months (May through September) Baltic itineraries usually include Oslo, Copenhagen, Stockholm, Helsinki, St. Petersburg, and Tallinn. Voyages range from 10 to 16 days with shorter or longer voyages available. • In addition to Holland America’s Hermitage program in Russia, the line also offers trips to Petrodvorets (or Peterhof), the town of palaces. It’s the summer residence of Peter the Great built in 1710 with the Grand Palace, Peter the Great’s private study, gilded fountains, waterfalls, marble statues, and French gardens. • A drive through Estonia’s picturesque countryside to the ancient town of Rakvere, with vodka tasting at the Rakvere Distillery and lunch at the ruins of 13th-century Rakvere Castle is offered by Holland America Line along with a stop in medieval Tallinn. 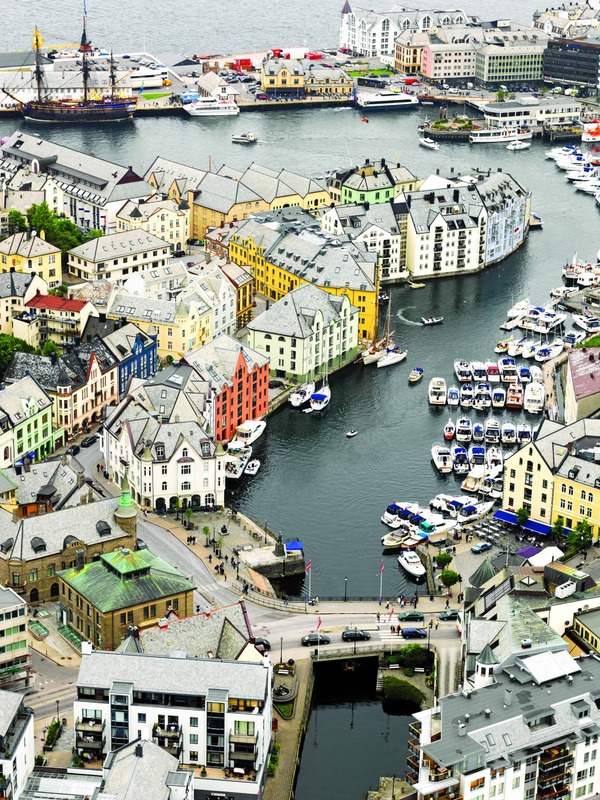 Terje Borud/VisitNorway.com• Alesund in Norway is known for its distinctive Art Nouveau architecture, faithfully rebuilt after a devastating fire in 1904. Walking tours are popular, viewing turrets and spires, medieval ornaments, and the picturesque fishing harbour. • In Sweden, Seabourn’s choices include a trip to the Volvo museum in Gothenburg and the chance to test-drive four different classic models on the driving track. A guided walk along the Old Parliament Building rooftop (40 metres above ground) in Riddarholmen yields panoramic views of Stockholm’s Old Town. The tour continues to other medieval venues including the former Stock Exchange, now home to the Swedish Academy and the Nobel Prize for Literature awards. • Under its Russia Today: A Slice of Home Life program, Seabourn passengers glimpse everyday life by riding the Metro and joining a local family for tea. • Windstar’s yachts can access the harbours and coves unreachable by larger ships and among the shore offerings is a Belgian chocolate tour in Ghent, or fishing in the unspoiled Aland Archipelago. • Seabourn ships are also in the “small” category, allowing calls in small Baltic towns like Klaipeda, Lithuania; Riga, Latvia; and Mariehamn, a Finnish territory. Seabourn also features a three-day stay in St. Petersburg. • Norwegian Cruise Line offers nine-day cruises in the area, and an overnight in St. Petersburg. NCL also features Berlin Wall tours, open-air market shopping in Helsinki, and a visit to the Vasa Museum in Stockholm to see the world’s best-preserved 17th-century ship. Some cruise lines include free accommodation or two-for-one deals at pre- and post-tour hotels. And as Holland America’s Director of Public Relations, Erik Elvejord, points out: cruising is a great way to avoid visa hassles for different ports as shore tours include the paperwork.